Today I have been very lucky and at the end a happy man 😀 I was able to work TX7EME. That one is activated by Giulio, IW3HVB. The EME window to Tahiti is very small only 1-2 hours and the distance to the moon is far so not the best conditions. 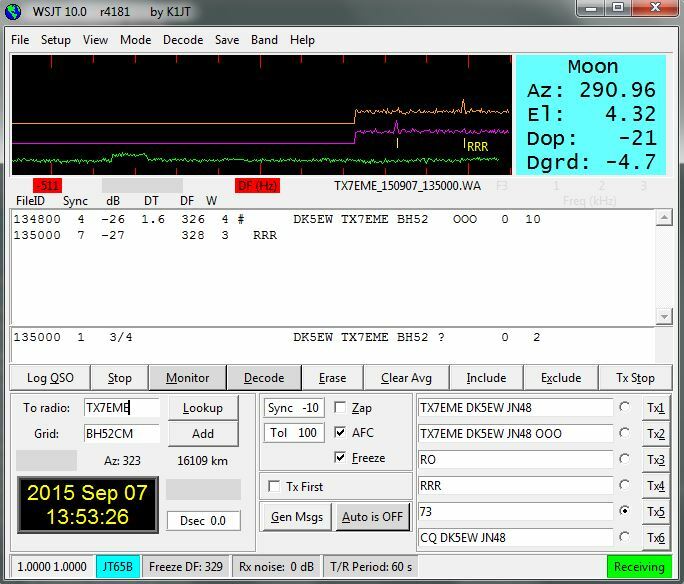 I arrived at my QTH when the moon was already only 6 degrees on moon set. Till connecting RIG and calling the moon was only 5 degrees left so I tried and after only 3 calling sequences he came back for me. Signal was in that moment not too big only -26dB but enough for a successful QSO.